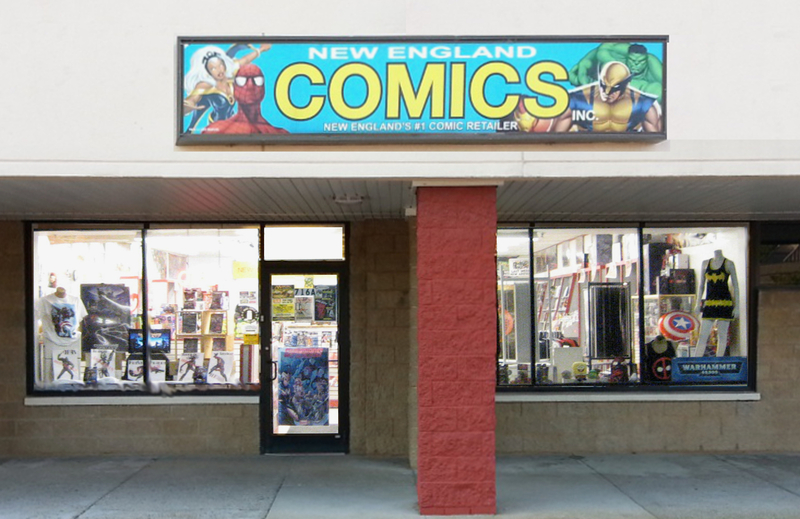 NEW ENGLAND COMICS | The Tick, Comics, Toys, Games, and More! Secure Online Ordering! Join NEC's E-Mailing List! Subscribe and receive our weekly New Arrivals email and advance notices of sales and other special events. GAMING events too! Email: We NEVER share our mailing list! 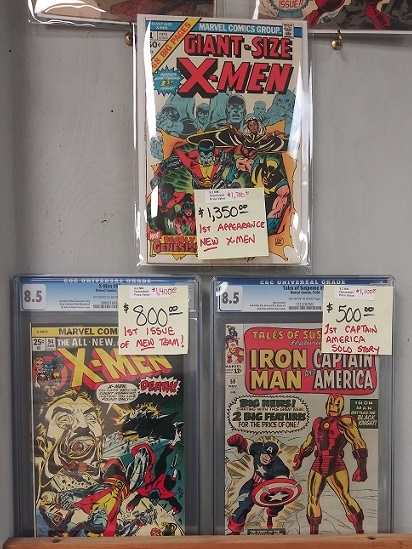 New Silver Age collection in Quincy! CLICK! "Every Day" graphic novel discounts! includes new arrivals & special orders! 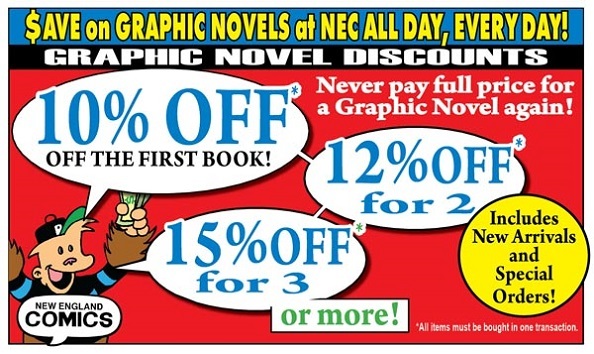 SMASHES PRICES ON GRAPHIC NOVELS! policy to continue indefinitely, we can't predict the future and prior purchases and sale items excluded. to alter or discontinue this new policy at any time with or without notice.ce. NEC ARCHIVE COMICS ON SALE NOW! 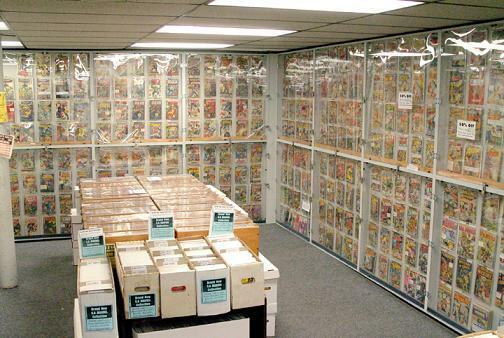 OVER 8,000 COMICS TO CHOOSE FROM! All of the "NEC Archives" are now in Brockton and on sale! That means nearly every Marvel, DC, and Image comic from the last 8+ years is up for grabs! runs of titles in these boxes. Even stuff as recent as the last few months of 2018. Note: these comics are not in any order. So you have to sift through them to find what you want. But it's well worth your time! Your comics pulled for you first thing on New Arrival Wednesday. Never any charge for the service, of course. if you buy enough comics each week. Inquire at any NEC store! All new limited edition cover! Available for order right now! These limited covers are available now! WE BUY COMICS, TOYS & MORE! Cash can be used to buy ANYTHING, including New Arrivals! Click image below for complete info. If you have a collection you're interested to sell call your local NEC store, or Tom, our Buying Manager. or 617-770-1848 the rest of the week. 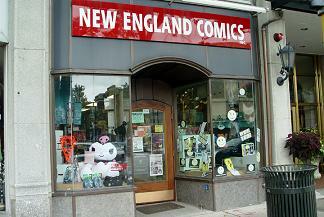 NEC is always interested in buying old comics and will pay $$ REAL MONEY $$ for them. No collection too small or large. Wanted for comics from 1930s-1980s and some later. Ex: Amazing Spider-Man issues from #1-10 can get you minimum of a few 100s to 1000s $ or MORE. But we'll take later issues also. We WILL buy modern comics from the 1980's to present, paying in the range of 5-25 cents each. But will pay lots more for key "in demand" modern comics like early Walking Dead, Deadpool, Thanos and other similar type "hot" comics. Note that we may decline to purchase any comics, such as recent comics of which we may already have a large supply, at our exclusive discretion. 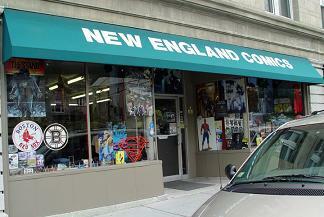 NEC will also take your older super-hero, sci-fi & fantasy-related action figures. Paying anywhere from $ to $$$ each for unopened figures (still in their packs). Older vintage original Star Wars figures from 1977-1983 will command MUCH Higher prices from $10.00 - $100.00+++. Note that NEC reserves the right to decline to purchase comics offered to us at our sole discretion. ROMANCE and TV/MOVIE related comics. POP CULTURE HISTORY by visiting us. YES, WE BUY OLD COMICS! TRADE PAPERBACKS & GRAPHIC NOVELS! TO SELL YOUR COLLECTION, CONTACT ANY NEC STORE TO MAKE ARRANGEMENTS! NEC is always looking to buy old comics. We are mainly looking for comics from the 1960's to 1970's and OLDER. 1960's comics will have 12-cent cover prices and 1970's will range from 20-35-cent cover price. Most comics from the 1990's to present may not be needed unless it's a key or major first issue. Old "Super-hero" comics will get the highest prices with Marvels topping DC's but we will also consider other comic genres. Golden Age (1940's) will get top prices regardless of the publisher or genre! 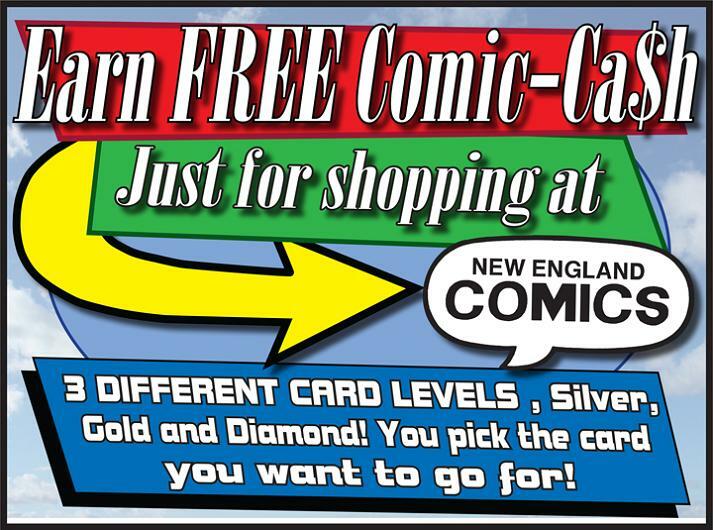 If you have a few comics or a large collection to sell call your local NEC store or our main comic buyer Tom at 617-770-1848. Note that NEC reserves the right to decline to purchase comics offered to us at our sole discretion. 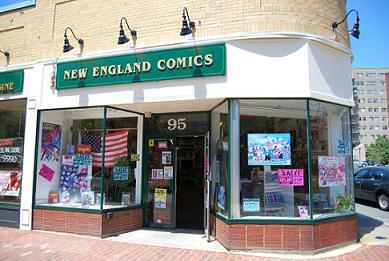 There are seven convenient New England Comics locations in Boston and surrounding suburbs. Each store stocks an eclectic assortment of comics, games, toys and more. New Arrivals every Wednesday morning! 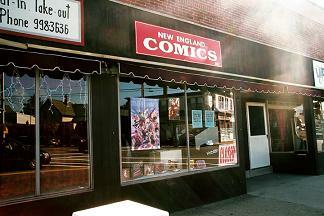 Order hundreds of comics and collectibles from New England Comics FFAST Mail Order Service. You'll benefit from discounts, easy ordering (online or offline! ), and fast, friendly service. 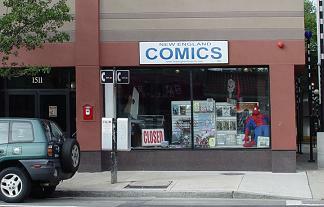 New England Comics is the "Home of the Tick", and an unbeatable selection of Tick comics, t-shirts, action figures, and more. LOTS OF COOL STUFF EVERY DAY!! Click here to check 'em out! Magic card collection just in! Click for INFO! Also includes 10,000 Marvels and DCs from 1970s-current. Available @ only $2.00 ea or $1.50 ea for 50 or more. NEW PRINTING OF THE COMPLETE EDLUND TICK TRADE! NEW EDITION! This is the 4th Edition of this classic Tick collection, released in 2017 to popular demand. Includes an awesome 8-page story available nowhere else from Tick All Star creators Benito Cereno & Les McClaine! 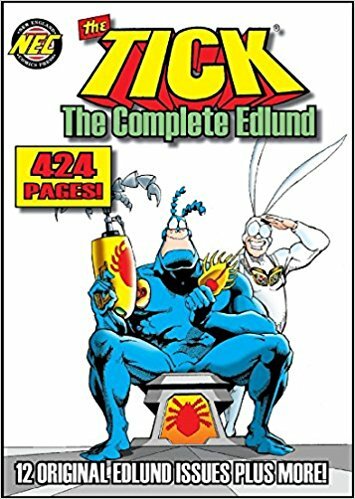 An untold story which answers previously never-answered questions about mysterious events which befell The Tick in the original Edlund storyline! The Tick: The Complete Edlund 4th Edition collects all 12 issues of the classic Tick series written and drawn by creator Ben Edlund, along with commentary from Edlund, the first Tick story (originally published in the NEC Newsletter), rarely seen back-up stories, pin-ups and for a bonus Pseudo Tick #13 which provides a possible conclusion to Edlund's original storyline. A complete package of fun in a 424-page edition, newly released in 2017! Note: NEC has no "seasonal" positions. Please make sure your "app" is NEAT and COMPLETE. pick up or submit an app. NEC has technical work available for persons skilled in computer maintenance and/OR programming, particularly website design. NEC IS AN EQUAL OPPORTUNITY EMPLOYER. 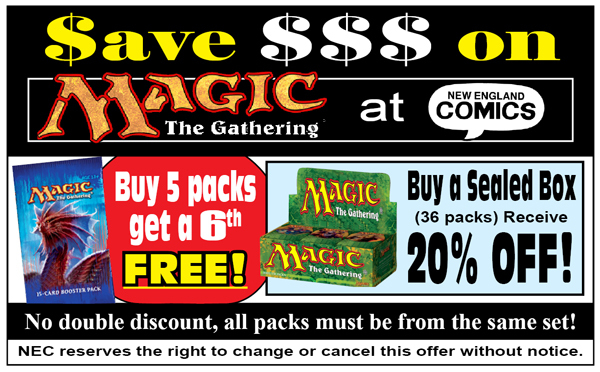 NEW BEDFORD GAME TOURNAMENTS: MAGIC FRI 7pm and Sunday's at 1:00pm, POKEMON Wed 5:30, Warhammer/Dice Masters every Sat. NORWOOD: Next Magic tournament---> CLICK HERE!! 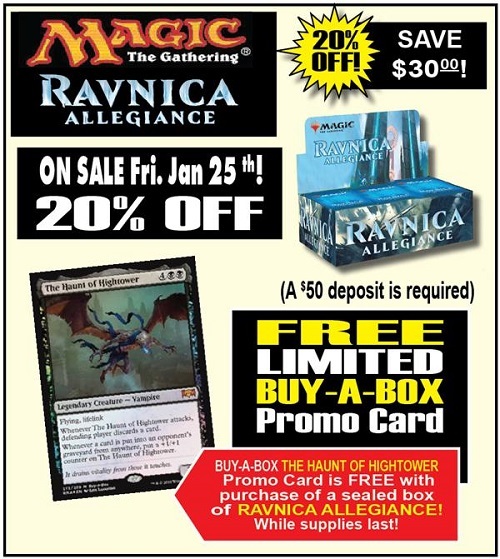 BROOKLINE: Magic tournaments EVERY Fri and Sat--->CLICK HERE! Please arrive 1/2 hour before start. Times are subject to change so call the store to confirm. 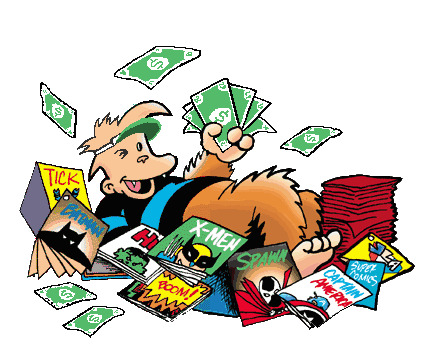 NEC IS BUYING COMIC-RELATED BOOKS! Trade paperbacks, Hardcovers & Graphic Novels! 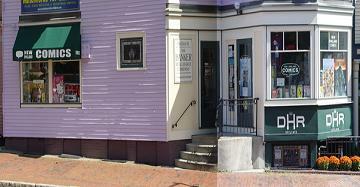 Visit our SEVEN Boston Area Stores! Please click each pic to go to store's home page. All stores open 7 days except where noted. Click pics or call for more info! ©2017 New England Comics, Inc. All Rights Reserved.